Apple’s HealthKit demonstrated that Apple cares about people’s health, and that commitment has been extended further and deeper with the announcement of ResearchKit. While HealthKit is dominated by fitness style apps that track data you can share with your doctor, ResearchKit is aimed at researchers who can use it to build clinical trial apps to take advantage of these incredible devices we’re all carrying around with us to combat disease. Right now, clinical trials are hard to conduct because people don’t want to take the time to take part, or don’t even know they’re being conducted. 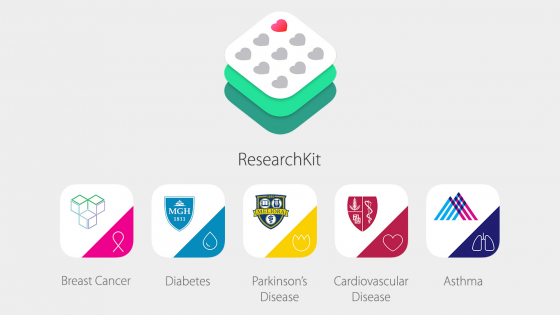 ResearchKit apps will greatly increase researchers’ access to potential trial volunteers. ResearchKit has been designed to keep users’ privacy in mind; Apple never sees your data, you’ll always be aware of the information you’re sharing with the researchers, and you have the final say over whether you share it or not, in addition to which studies you want to take part in. At launch on March 9th, 5 apps have been developed. These are intended to combat Parkinson’s, diabetes, cardiovascular disease, asthma, and breast cancer. The most stunning part of the ResearchKit announcement was the revelation that Apple has made ResearchKit open source. That shows true commitment to doing good in the world; people on all platforms will benefit from this in the long run, and everyone wins.